The remote settlement of Parakumpura lies close to Tanamawilla in the Wellawaya District of Sri Lanka. 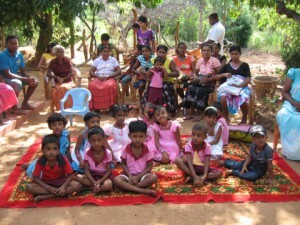 It suffers from severe drought for most of the year and before the agreement of Project Sri Lanka to construct a well, villagers had to walk to the river to collect water for drinking, cooking and washing. This water was not fit for drinking purposes but was all that was available. Mr Kumara, land owner, generously donated an area of land with a natural spring to enable a well to be built that can retain water throughout the year. The new well, constructed in 2015 is some 20 feet in diameter and 20 feet in depth. It not only provides water for drinking and basic household needs, but also for the growing of crops. Villagers are now able to cultivate areas of land for the production of chillies, red onions, papaya, long beans, eggplants and peanuts. The local people generously donated their time and energies to help with the construction of the well, with skilled labour only being hired for such tasks as masonry. Some sand was available locally and materials including stone, cement and bricks were purchased and transported to the site. The construction of this well was a successful partnership model involving the local people, Project Sri Lanka and local Sarvodaya Shramadana office bearers who ensured successful completion of the works. When Trustees re-visited this well in 2018 they learned of the very serious drought that had affected the area over the past two years. That said, the well still supports agriculture. Crops include peanuts, bananas and beans. The well continues to make a significant contribution to life here.